Easter Bunny Chocolate Truffle Spoons – An easy chocolate peanut butter truffle recipe made on spoons for easy dipping and decorating! There are so many good things going on here today. Adorable bunnies. The beloved chocolate-peanut butter combo. Swoon-worthy homemade truffles. Portable hand-held devices… All rolled into one glorious treat. Six years ago I posted my first ever truffle on a spoon recipe for Valentine’s Day. At that time, there were no other truffle-spoons or chocolate-coated-candy-on-a-spoon recipes floating around the web. Trust me. I checked and checked because it’s so rare to share something that hasn’t been done before in some way, shape, or form. Does this mean I invented this concept? Who knows. Maybe truffle spoons are my “signature recipe” or maybe I was just the first person to ever post them online. Either way, I feel a small sense of pride for being a trendsetter, even in this one little area. I know it’s silly, but I’ll take what I can get. Nowadays, you can find many varieties of spoon-treats floating around the web. However, right now at this very moment in time, I have found no other chocolate bunny candied spoons posted on the internet. Why Are Chocolate Truffle Spoons So Great? So glad you asked! If you’ve ever made classic homemade truffles or other chocolate-coated homemade candies, you know it can be tedious work. Scooping, rolling, or piping the filling is a painstaking chore, leaving you with dirty hands (or pastry gloves.) If you are working with whipped filling, you have to be careful not to touch it and melt the filling with your body warmth. Also dipping those little balls can be a nightmare if you are inexperienced. They are likely to drop into the pure melted chocolate and ruin the entire batch. However, using spoons as a platform for scooping the filling and dipping in chocolate is another thing entirely. Guys, this is so much easier! The edge of the spoon makes it possible the scoop perfect portions. 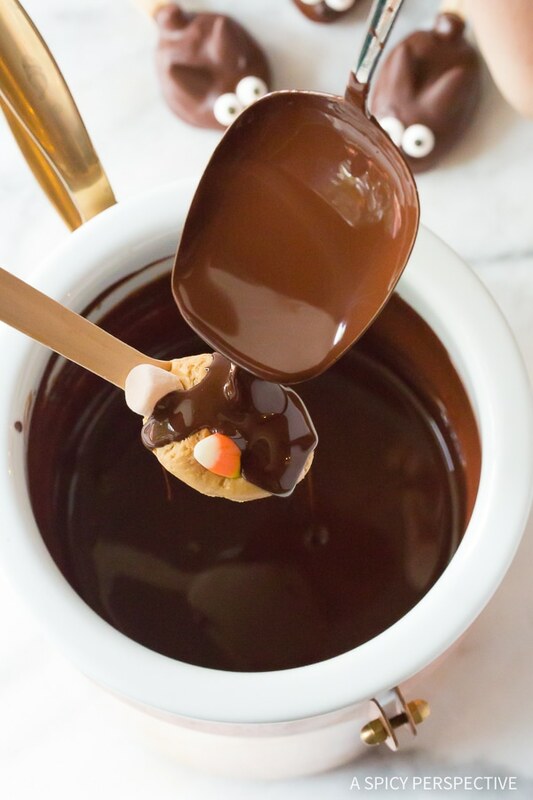 The filling sticks to the spoon so it does not fall off into the chocolate when dipping. 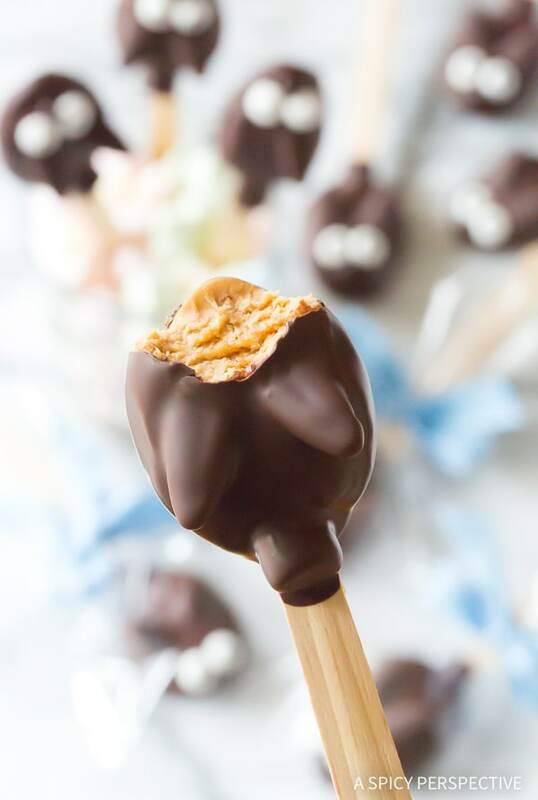 Best of all, you’ve got a built-in handle for savoring your chocolate peanut butter truffle in slow nibbles… No need to pop it in your mouth all at once. You can pass them out at parties, offer them as gifts in spoon boutiques, or stick them in Easter baskets this year! 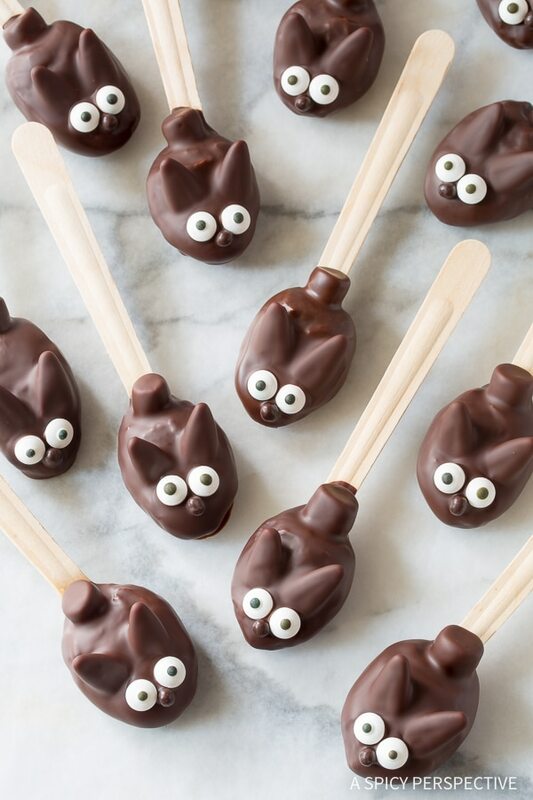 Our Easter Bunny Chocolate Peanut Butter Truffle Spoons are so cute. Yet it’s the chocolate peanut butter lovefest that really makes them irresistible. Using dark chocolate for the coating offsets the salty-sweet peanut butter fluff on the inside. 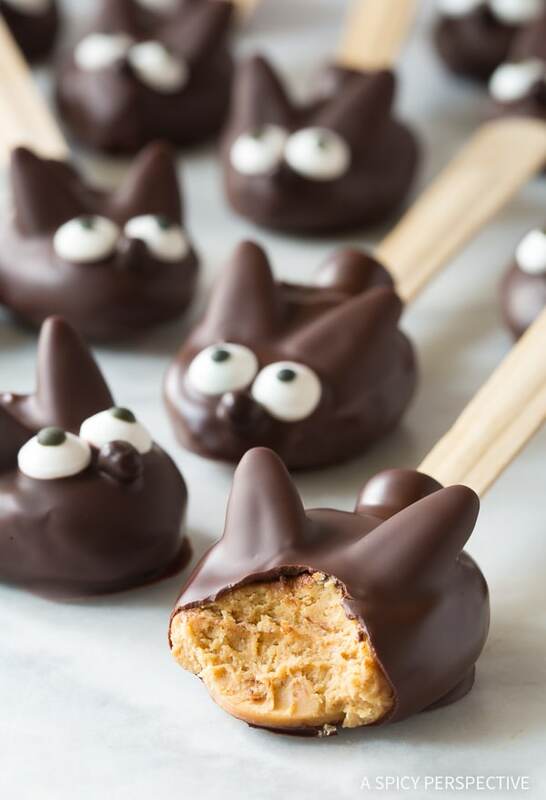 Reeses shmeeses… These bunnies are so very rich and pillowy, you’ll never settle for store-bought choco-peanut butter treats again. 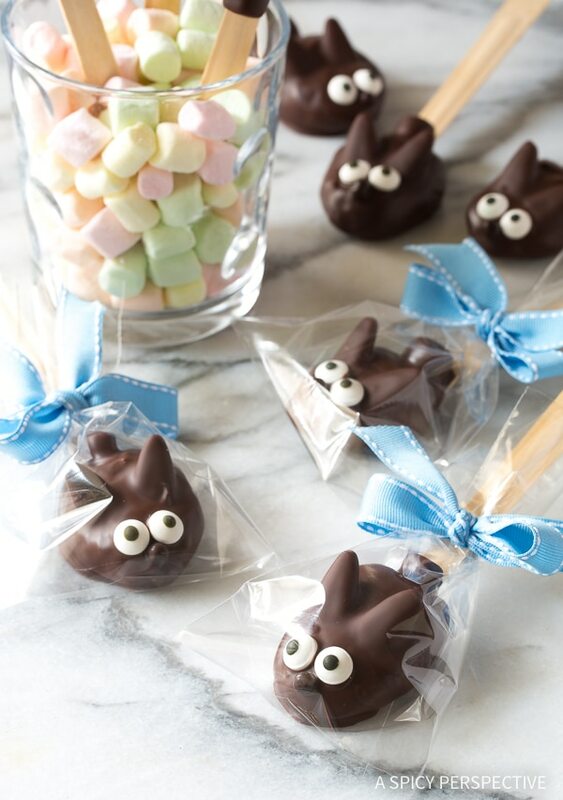 You will need several varieties of candy to turn these truffle spoons into cute little Easter bunnies. 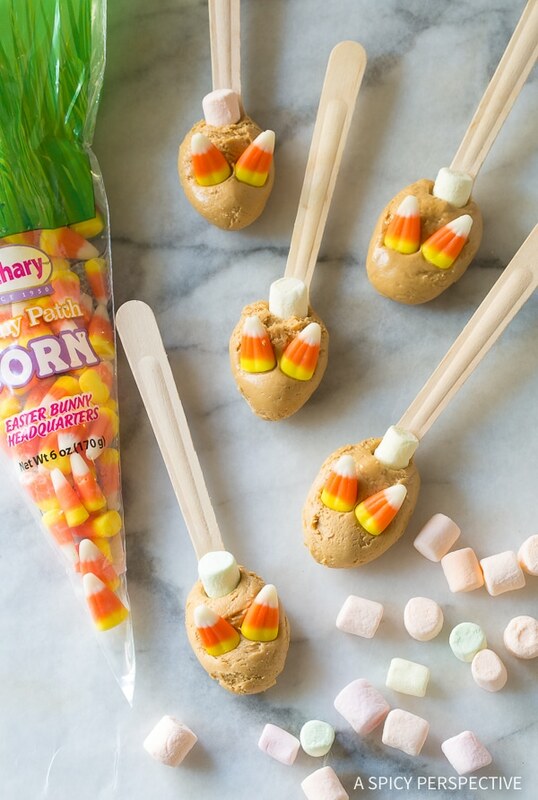 For the ears, candy corns can be found in the candy aisle of most grocery stores year-round. For the eyes, look for candy eyeballs in the baking or cake decorating section. If you can’t find them, look for small eye colored candies like Sixlets. For the noses, use small chocolate drops (or brown Sixlets) or you can look for something small and pink, maybe a larger type of sprinkles. 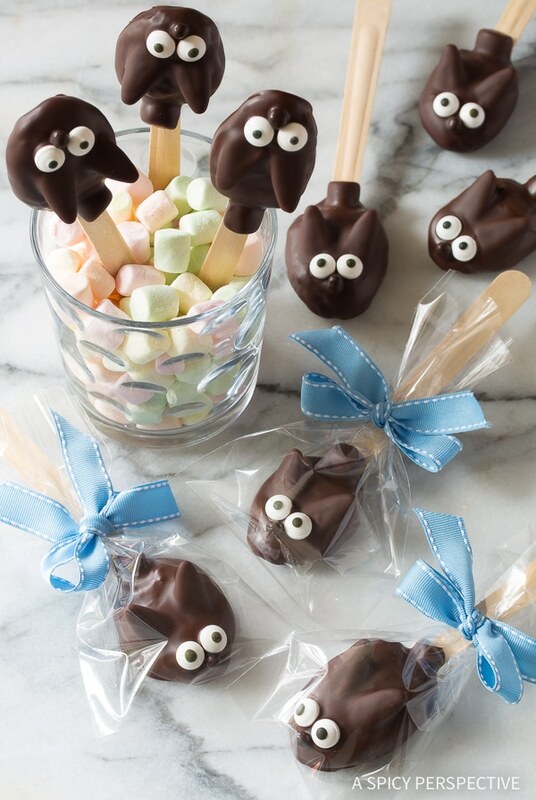 For the tails, use mini marshmallows (any flavor). Once you make the peanut butter filling and scoop it onto the disposable spoons, press the tails at the base of each bunny right above the handle. Then attach the ears close to the tip. Try to angle them so they point up. That way, they will still look like ears once covered in chocolate. 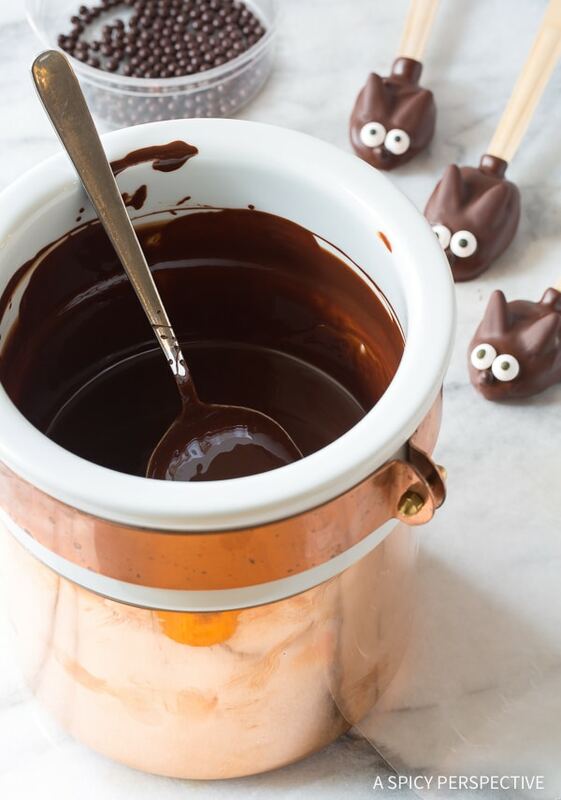 Most importantly, chill the bunny spoons before dipping them in chocolate. It can be tempting to rush through this process and skip the chill time. Yet, the filling will flatten under the warmth of the chocolate and it’s likely you will lose an ear or two. An hour in the refrigerator ensures the bunnies will hold their shape. Calm down, I’m not asking you to pull out a candy thermometer. You can easily temper chocolate by melting most of your chocolate over the stovetop, then add a little more chocolate at the end, to cool it down. Tempering, the process of heating and cooling chocolate slowing, creates that glossy sheen once dried, so your chocolate coating does not turn cloudy. Chocolatiers would tell you there’s much more to tempering than this, and they are right. But for our purposes, this simple tempering method is all we need. You can dip the bunnies down into the chocolate, but I feel like I have more control over the coating when I spoon the melted chocolate over the bunnies. Once the chocolate bunnies are completely dry you can box them up or wrap them in individual cellophane bags. 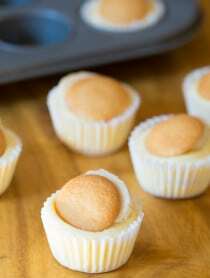 Do not keep them in the refrigerator, they are best left out at room temperature, so the filling is soft and melts in your mouth when you take a bite. 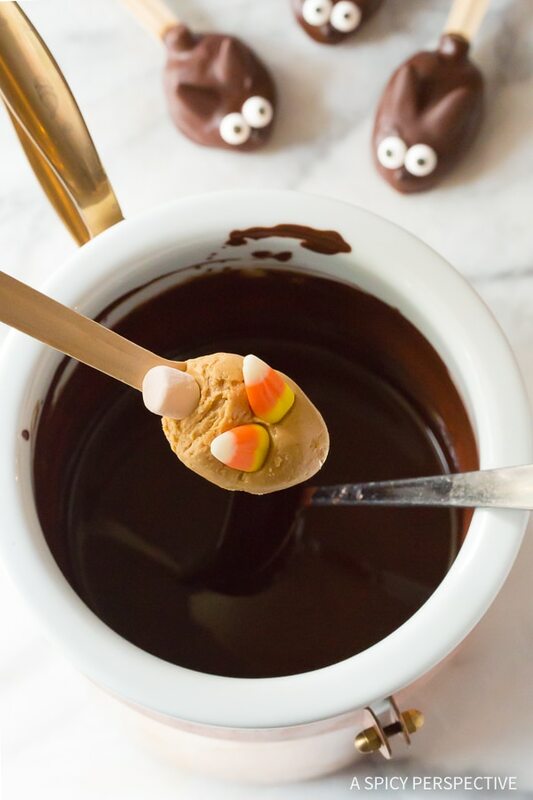 Skip the store-bought bunnies this year and make Easter Bunny Chocolate Peanut Butter Truffle Spoons instead. And don’t forget to let me know how they turned out in the comments below! 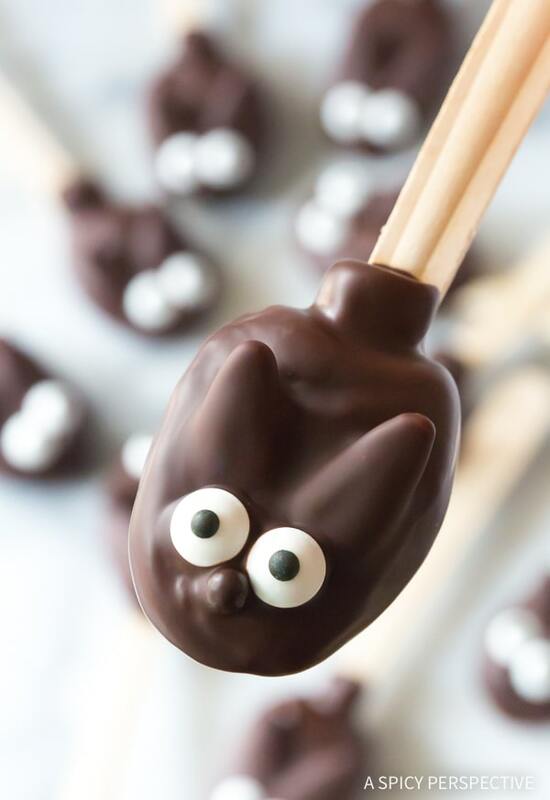 See The Recipe Card and Video Below For How To Make Easter Bunny Chocolate Truffle Spoons. Easter Bunny Chocolate Truffle Spoons - An easy chocolate peanut butter truffle recipe made on spoons for easy dipping and decorating! 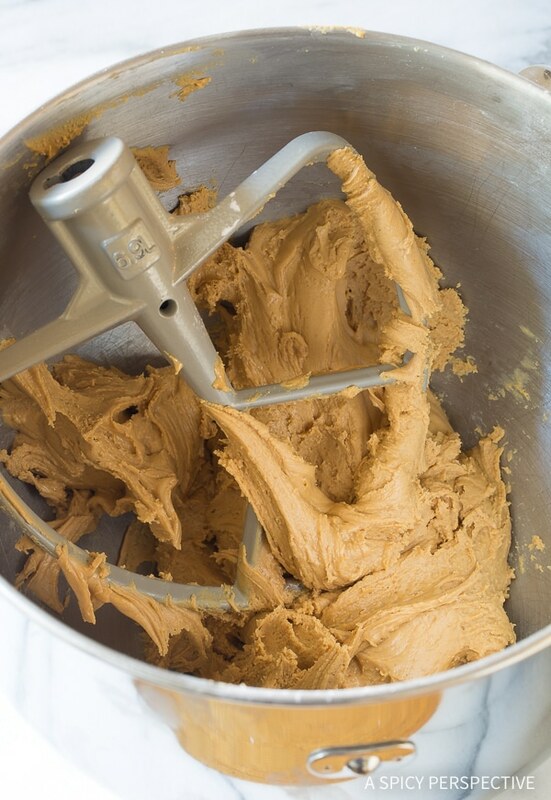 Scoop the peanut butter into the bowl of an electric stand mixer. Add the vanilla extract and salt. Beat to combine. Then turn the mixer on low and slowly add in the powdered sugar and cornstarch. Once combined, scrape the bowl with a spatula, then beat on high for 2-3 minutes to lighten the texture. 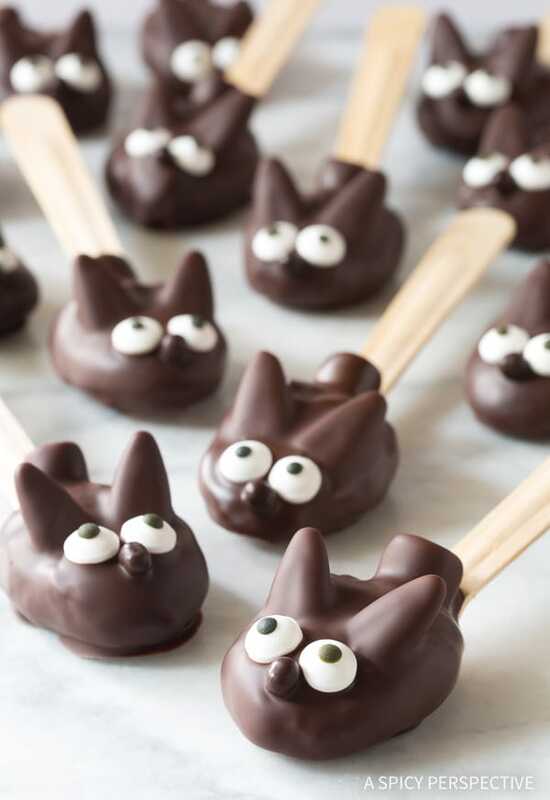 Place the spoons on a baking sheet and refrigerate for at least 1 hour to firm up the filling and ensure the ears and tails don’t fall off when dipping in chocolate. When the peanut filling on each spoon is cold and firm, place 7 ounces dark chocolate in the crock of a double boiler. Filling the lower pot with one inch of water, set the crock on top, and set the pot over medium-low heat. Stir the chocolate until melted. Then turn off the heat and add the last 2 ounces of dark chocolate. Stir until all the chocolate has melted. This tempers the chocolate so it does not turn cloudy once dried. Lay a large piece of wax paper out on the counter. Take 2-4 truffle spoons out of the refrigerator at a time, leaving the rest to chill as you work. 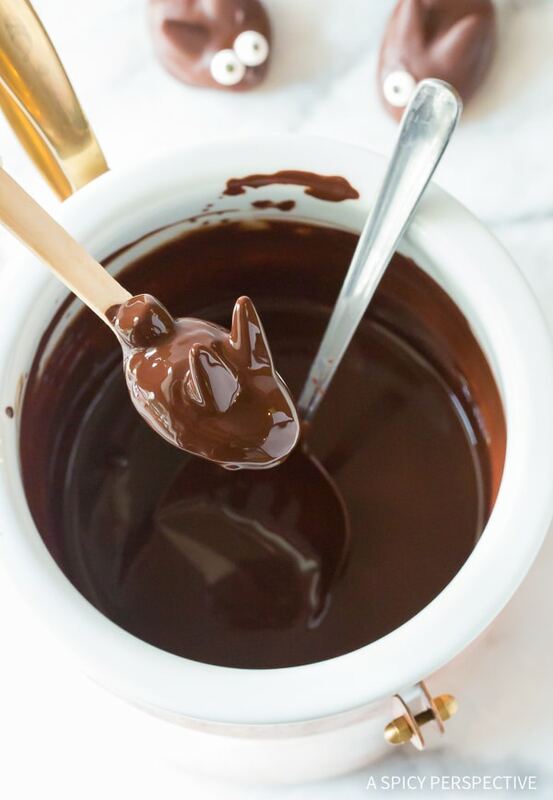 Hold one truffle spoon over the pot of chocolate and use another large spoon to shower the truffle in melted chocolate until completely covered. Tap the truffle spoon gently on the edge of the pot to remove extra chocolate. 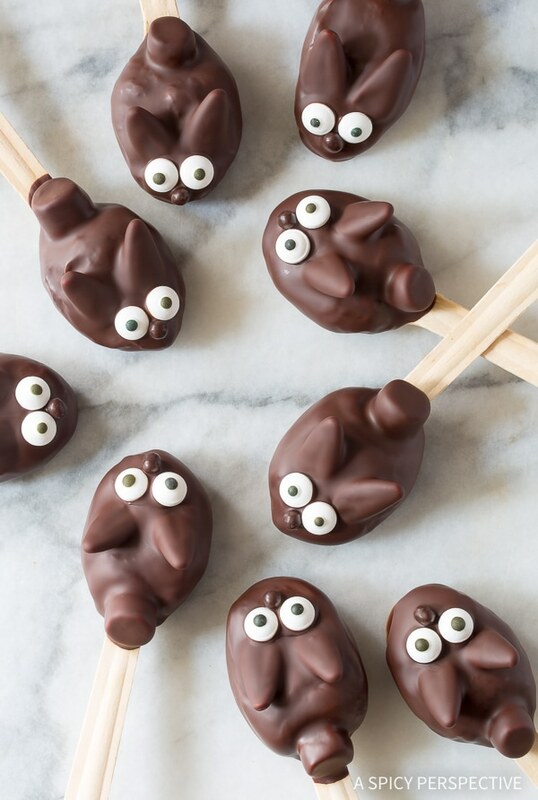 Set each chocolate-coated bunny spoon on the wax paper. Quickly attach two eyes and a nose in front of the ears, before the chocolate hardens. Repeat with the rest of the spoons. Once completely dry, wrap each bunny truffle spoon in a small cellophane bag and tie with ribbon. 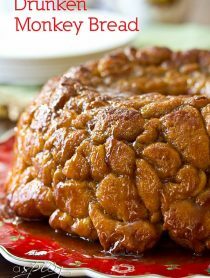 Leave at room temperature for up to 1 week. They are so easy to make and really adorable! How cute are these.. My nieces will be thrilled when I make this recipe next week. Thanks for sharing. These are sooooo adorable for Easter! SO yummy and adorable!! Perfect Easter treats! 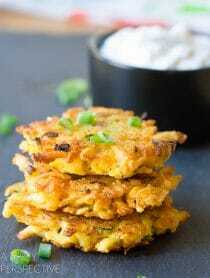 A perfect and yummy taste loaded on spoons. Thanks for recipe dear. That one was very creative one. Thanks dear for this.